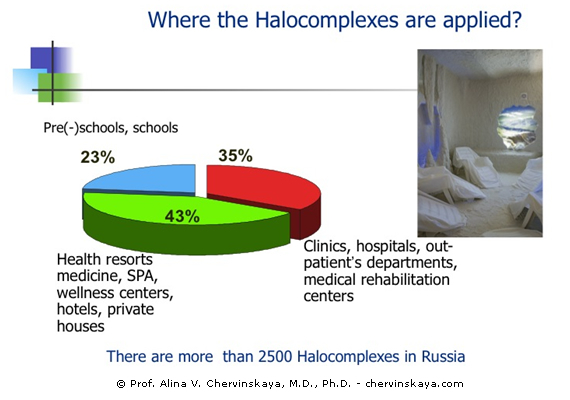 Field of Halotherapy application | Prof. Alina V. Chervinskaya, M.D., Ph.D. The impact of Halotherapy on various pathological processes in the respiratory tract and human organism as a whole and a possibility of selecting the parameters in Controlled Halotherapy ensure the method adaptability to the conditions of different areas of medicine and healing. Dosing of the dry salt enables to apply Controlled Halotherapy to both pre-morbid states of respiratory diseases and diseases at heavy stages of obvious obstructive with severe disabilities. This has laid down opportunities for a more extensive application of this method in the recovery and rehabilitation medicine, industrial rehabilitation, health spa field, kids’ educational institutions. 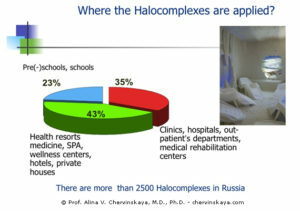 Today, halo-complexes with the controlled microclimate are installed in many hospitals, factories, kindergartens, rehabilitation and health recovery centers. Presently, in the practical healthcare facilities, over 4,000 salt rooms that use the technique of controlled curative microclimate are deployed. Prolonged clinical application of the Halotherapy method in various areas of medicine (namely in pulmonology, allergy, pediatrics, otolaryngology, dermatology, and phthisiology) and the research of its mechanisms have led to the understanding that this method has a pronounced healing effect. In recent years, a new area of the Controlled Halotherapy application in the health sector has started to develop – the HaloSPA™ technology. Stay in a comfortable environment, and a positive impact on psycho-emotional state create additional opportunities and advantages for the use of Halotherapy in spas and wellness-centers during health vacations. Of course, Halotherapy, like any other method that actively influences the human body, has its limitations. The systems with controlled halo-aerosol support its effective concentrations for the recovery, ensuring a minimal risk of possible complications. However, it should be noted that application of Halotherapy without medical caring, namely HaloSPA™ requires a separate consideration.